An International exhibition of photomedia from Iran. In Ey! Iran, social realities of hope, temptation, nostalgia and introspection are captured through the Persian lens. The exhibition depicts a culture surprisingly familiar to ours – narratives of family life, suburban sprawl and poignant observations on a country immersed in longstanding customs and traditions. The artists take on issues of identity, gender and social restrictions and by doing so capture a side of Iran which is often contrary to that presented by the Pentagon and the western media. The exhibition is a Gold Coast City Art Gallery initiative. Gallery curator Mandana Mapar was born in Iran, raised in New Zealand and is now based in Queensland. She has drawn together 18 photo media artists for this project, most of whom still live and work in Iran (although many exhibit widely overseas). This exhibition is opportunistic. But not in the way you might think. It is not jumping on the back of daily news coverage of areas of war and devastation in the Middle East (that disparate entity of over 20 different sovereign states spread over three continents), but rather, this exhibition is opportunistic in using the expertise and intimate knowledge of Mandana Mapar. Although she has spent most of her life in either NZ or Australia she has keep alive her links with Tehran and elsewhere in Iran. Who better to curate a survey in tandem with a Tehran based colleague for Australasian audiences? 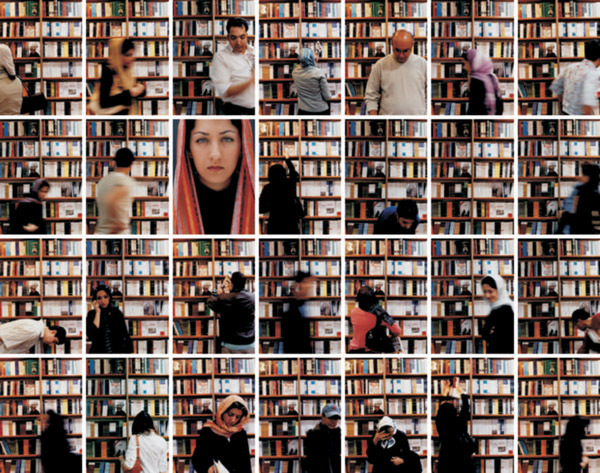 The show is also opportunistic in a further positive sense in that it allows us to see at first hand what contemporary Iranian photography is like as is emerges from within that culture, not at one remove. Although most of the photographers and filmmakers represented here have travelled and exhibited extensively outside of their country, most were trained in photography at Tehran’s Azard University and their imagery (which is produced in Iran) is not stereotypically Persian. By this I mean that Mandana and her colleague have chosen photomedia images that do not necessarily cater to popular expectations. It is non-conformist and challenging. 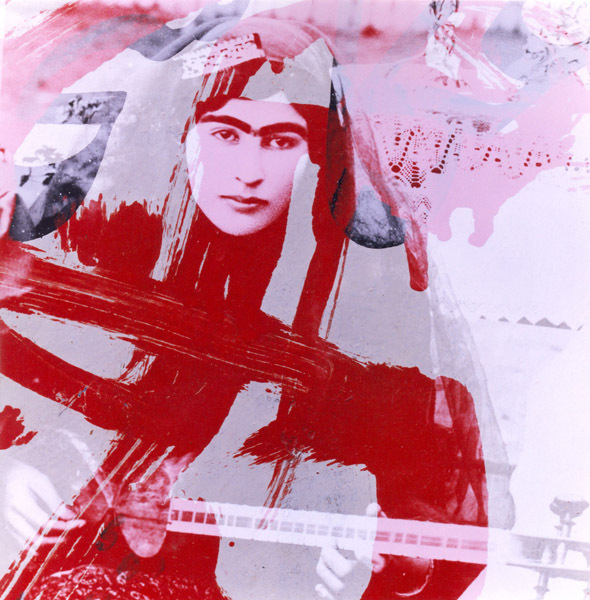 Western viewers often slip into binary definitions (such as east versus west, tradition versus modern and so forth) when confronting art from non-European cultures. However, globalization has upturned such simplistic distinctions and when you view this exhibition you are immediately struck by similarities with what occurs elsewhere in creative photography. The same processes, stylistic conventions and subjects are reflected here. 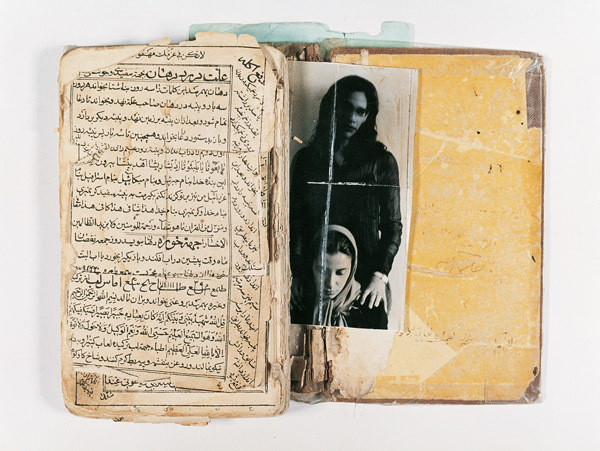 What does distinguish these photographs by senior, mid-career and emerging practitioners are the subtle references to social realities in contemporary Iran, the coding of a culture that is different from our own here and the emphasis on individual identity through self-portraiture. One can gauge an active curatorial involvement and passion in the project rather than one that is politically correct. There are for instance 4 female exhibitors and the rest are male. Yet, it is the quality of the photographs in formal and conceptual terms that has been of paramount concern to Mandana. When she traveled to Tehran in June to view and select images she wanted to choose imagery that was open and adventurous. Obviously, if more women artists had been located who demonstrated high calibre in their work they would have been included. Ironically, the one photographer from Iran who immediately sprung to my mind before I previewed Ey! Iran was Shirin Neshat who has developed in international career from her base in New York. 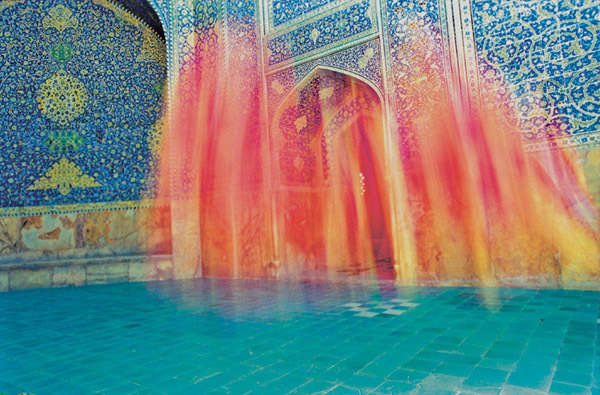 She takes Islam and gender as a core concern in her work, creating imposing scenarios. Although marvelous there is a slight nagging feeling that her imagery is essentialist and suits the western preoccupation with exoticism and the “Other”. By comparison, this show is much more about living in urban Iran today, and how globalisation works in breaking down barriers and distinctions. 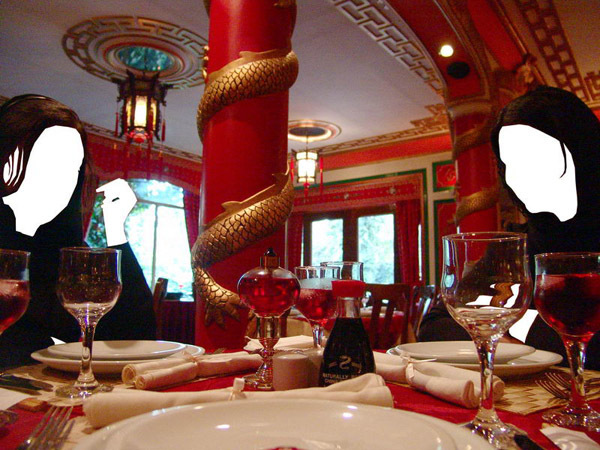 Globalisation has obviously brought western-originating impulses, in the broad range of photographic techniques alone. It is also witnessed at the start of the exhibition in the dark room where a film by Amirali Ghasemi shows Tehran at night with is neon signs overlapping in Farsi and English. Daily immersion in the urban centres of Iran has prompted artists to very naturally interweave eastern and western sensibilities and codes so that we get a richly hybridized ‘take’ on the culture. This is what it is like now, these photographs say. 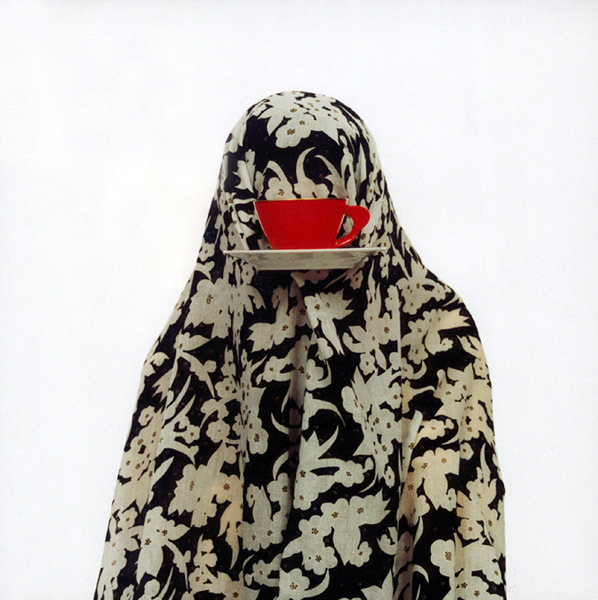 Personal identity is partly about the veil or chador and it is also about drinking tea from an English porcelain cup. Or it is about inserting one’s portrait in a grid of photographs in a book shop or a pharmacy. Or, as in Hossein’s case, identity is devolved from an expatriate situation (Hossein is an Australian based Iran artist). 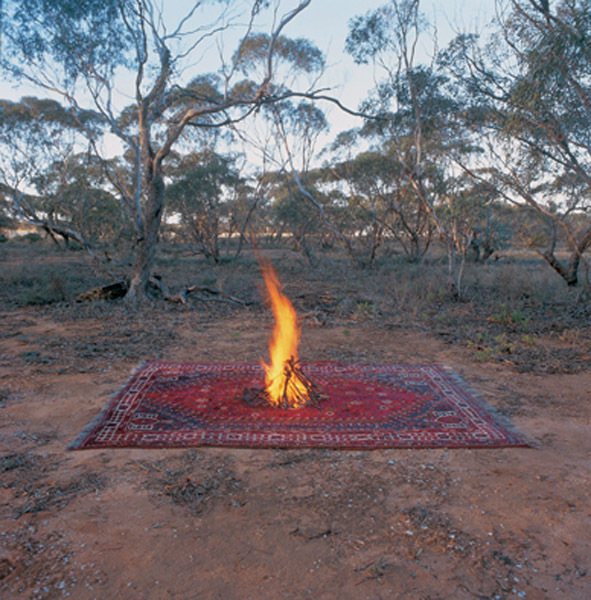 He comments on this trans-cultural state through a large-scale Type C photo titled Longing belonging, where a Persian carpet has been laid in a eucalyptus grove and lit in the middle with a campfire. Walking around Ey!Iran yesterday – the title incidentally equates with the first line of the country’s national anthem – I was struck with the refusal of the photographers to dramatise conflict or to give the viewer an overtly one-sided sense of Iran. Political commentary is obviously here, but it is nuanced and subtle. Take for instance, the reference to books and language. Arash Hanaei’s Estekhareh imagery replaces the famous Persian illuminated manuscript illustrations with contemporary photographs of women. 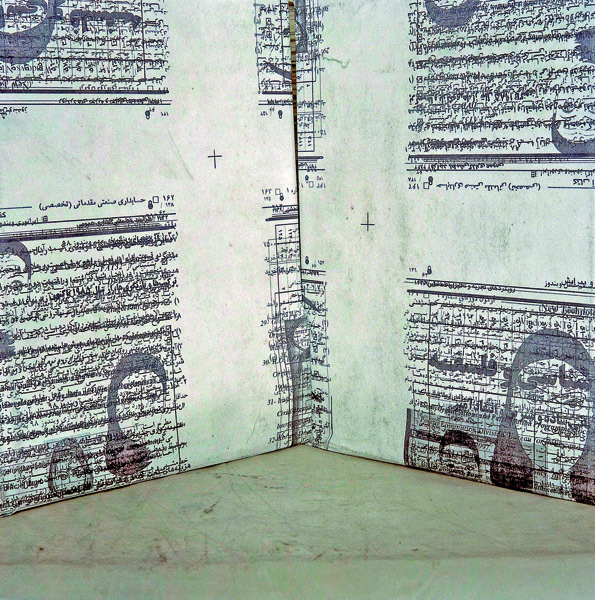 Arash’s work is juxtaposed with Mehran Mohajer’s Undistributed packages of newspaper covered books so that we conclude censorship still occurs in that country. I enjoy the way Mandana has hung works of a similar tenor together, like this. In the black and white photographs by Hamila Vakili’s simply titled Myself, jeans are worn in one shot and the chador in another while a brick wall behind has mortaring in one and is stacked without reinforcement in another. It is such a pared back comment on identity which goes beyond gender to a societal comment on the situation of the broader community. There is a very intimate video by Ghazaleh Hedayat, of a woman’s face soundlessly crying and at the opposite end of the spectrum, Sadegh Tarafkan gives us Temptation, which presents a heroic subject in alternative guise. In part a reference to the Last Supper he uses pomegranates not apples to convey difference. I could continue commenting on further works but I know that Mandana has already taken many of you around the exhibition and furthermore the catalogue essay by Hamid Severi is very interesting and informative. It really remains for me to say in opening Ey!Iran that I believe this is an important exhibition for us, not least because it is a departure from the historical shows we usually receive in this country from the Middle East. I hope that it tours widely and increases the appetite of all of those interested in contemporary photography to find out more about artists pushing the boundaries of creative expression in Iran. Anne Kirker is a freelance curator and writer and is the author of several publications including New Zealand Women Artists: A survey of 150 Years. Anne was Senior Curator (Special Projects) at the Queensland Art Gallery where she held the position of Curator of Prints, Drawings and Photographs from 1988-2001. She is currently working on a major contemporary Californian art exhibition for the new Queensland Gallery of Modern Art. This entry was posted in Past Tours on September 11, 2009 by Admin. Size: Flexible. Approx 70 running metres. Content: 31 framed photographs, PC based computer interactive and 3 DVD works (all can be projected onto wall, screen, or viewed as looped DVD on TV). Support Material: Labels, extended labels, intro panel and other didactic material. Publication: 28 page full colour catalogue with introduction, essays, artist’s statements and biographies. Education: DVD containing artist’s talks and other material TBC. Exhibition curator available for public programme events. Logistics: Exhibition fully crated including condition reports, check list, handling instructions etc.